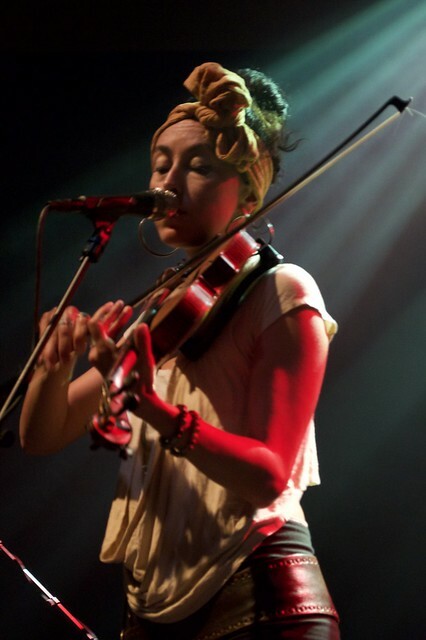 Posted on 06/01/2018 by Neal Keller	in Live Review and tagged 9:30 Club, Atlanta, folk, New Orleans, Rising Appalachia. 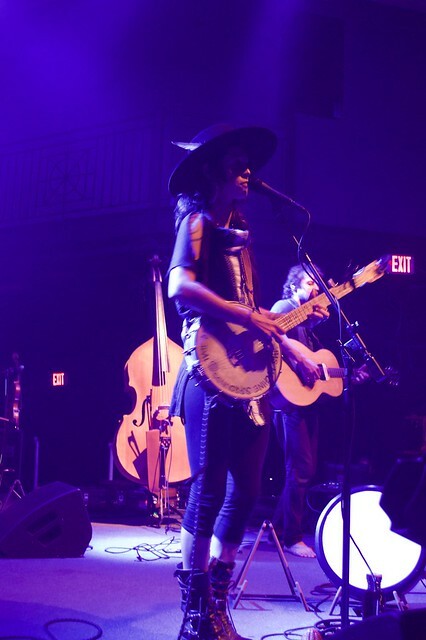 The music of Rising Appalachia seems intent on taking you to places. Places that are off the main roads, overgrown with kudzu, under the lazy glow of june bugs rising from beneath the porch swing. 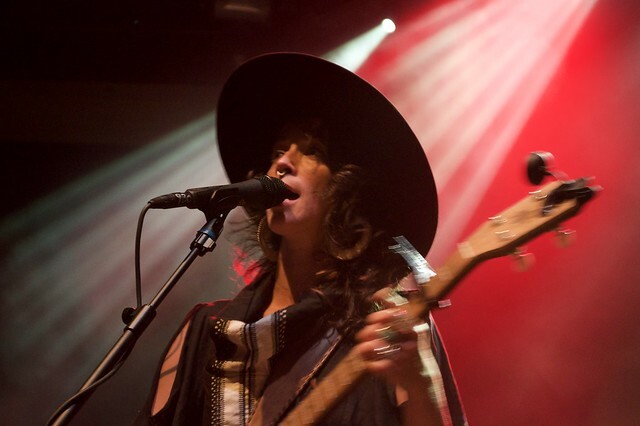 Their regional affiliations are alluded to in the band’s name, and as their set slowly unfolded recently at the 930 Club, they took the audience on a tour of the hazy south east. 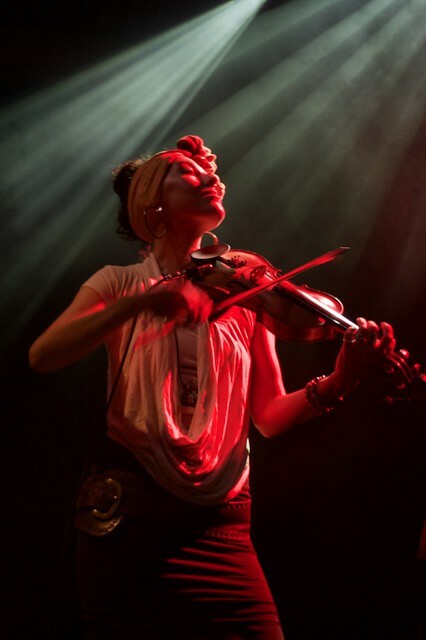 The rootsy folk influences that dominate their sound were laid out plain in their acoustically driven set, a selection of songs brought to life primarily through strings and percussion. Their vocal harmonies and intricate interplay recalled a little of DC’s Betty and a lot of The Roches. But there’s a lot more going on in the diverse rhythmical currents from which the group draws, and the range of styles they fuse together. Leah and Chloe Smith are the two key members of the group, and they opened the show with an a cappella rendition of “A Closer Walk with Thee” on May 25. Seasoned with a little Bayou boogie, the sisters teased us with a sample of the rhythmic vocal counterpoint that would infuse much of what would follow. As the song wound down, they provided their own imitation of a NoLa brass band complete with a little air trombone. Laid back and a little playful, they had already won the crowd over without displaying a trace of self-consciousness. The next thing was to launch into the accompanied part of the show, for which they were joined at first by a percussionist and a guitarist. 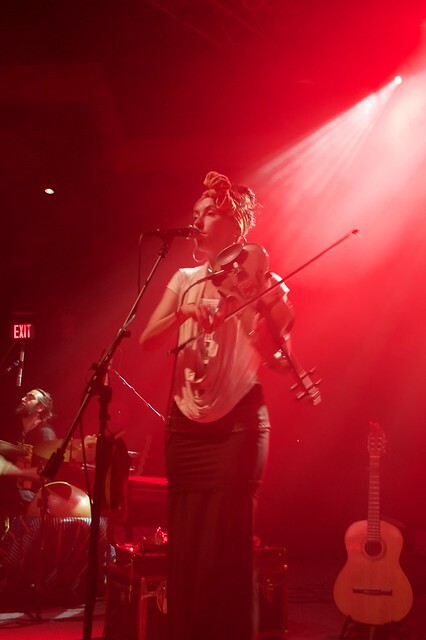 Chloe played fiddle while Leah picked up an acoustic guitar. All of the musicians on stage would end up switching up several times, displaying an amazing array of eclectic and traditional instruments. As mentioned earlier, all the instruments were based on either acoustic strings or percussion in some form or another. Deep resonant tones from drums and bows intermingled with washboards, handbells, bodhrán, and something very much resembling a marimba (although likely possessing of a much more exotic pedigree). The identity of the most unusual instrument of the evening escaped me, but it was at guitar like instrument with a body resembling a large gourd that produced a sound somewhere between a Japanese harp and a mandolin. During the song “Medicine,” the sound of this instrument was woven together with that of the guitars in a manner that elicited images of a lattice of silken threads spiraling around the vocal harmonies. I must commend the club’s sound engineer, Gus, for the clarity and definition his mix brought to the proceedings. The sound was full and detailed, yet gently complimented the intimate laid back nature of the performance. The selection of songs presented focused mostly on their most recent three albums, The Sails of Self, Filthy Dirty South, and Wider Circles. 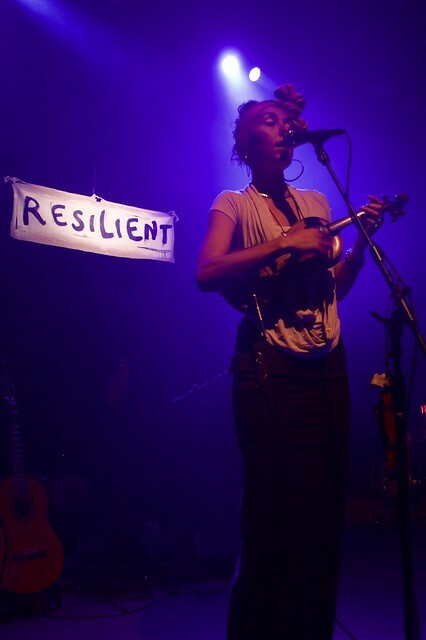 Rising Appalachia got an amazing reaction from the crowd as they spoke of the influence they drew from the protests to the Dakota Access pipeline, and for the song it inspired, “Resilient.” Of their otherwise sparsely adorned stage set, a sign on the backdrop with the word “Resilient” on it identified the spirit of their presentation. Of the journey alluded to in the opening of this review, other stops included the sisters’ hometown of Atlanta. Rising Appalachia played an especially sultry slow boil of a tune at one point, and just as I was thinking “Prince would have dug this,” they revealed that it was a cover of a Goodie Mob/Cee Lo Green song called “Beautiful Skin.” Following this revelation, I started to notice the street rhyme influence in their cadence. The naturalist undercurrents of “Medicine” evoked the feeling of the fabled and unspoiled green spaces of the Reconstruction-era south. 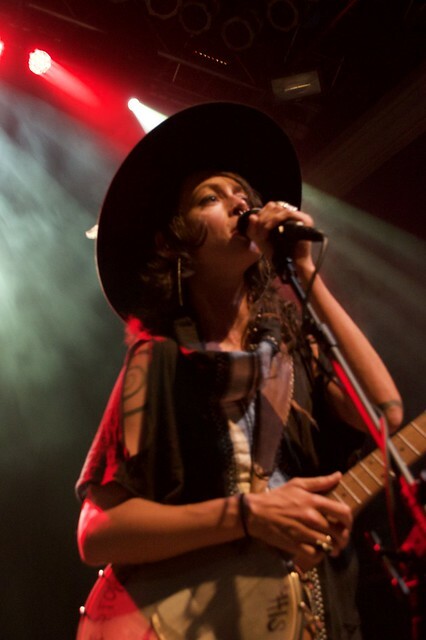 As Rising Appalachia wrapped up their set with “St. James Infirmary,” the group made sure to mention their work with the non-profit organization One Common Way, who had a booth set up for the show. For their encore, they once again appeared on stage unaccompanied, and offered an a cappella rendition of “Mississippi” from Filthy Dirty South. The audience went from clapping to stomping along, and the sisters created a stunning vocal counterpoint that layered triplet-based riffing over a swinging blues-inspired groove. 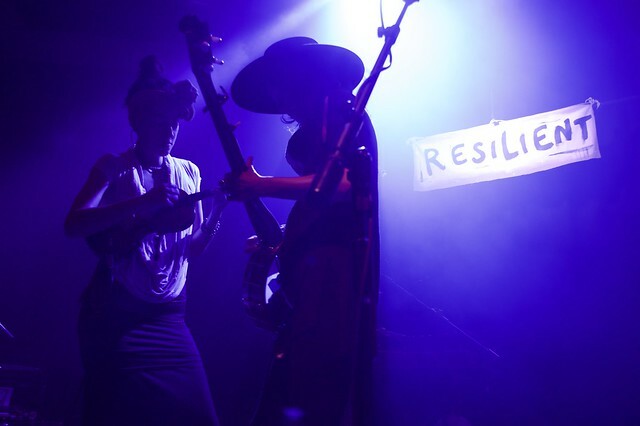 Rising Appalachia was unknown to me before witnessing this show, and I’m glad I saw them. 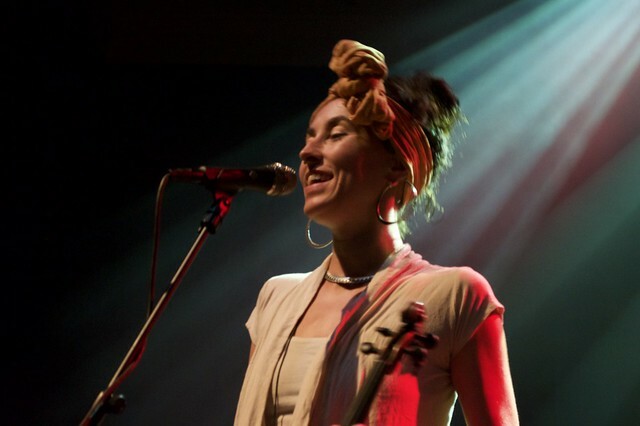 I have some familiarity with traditional folk and bluegrass, but I always had a more stifled relationship with the variety of post-modern folk represented by Ani DiFranco and the like. I have no problem with acknowledging the talent, the independence, the nutritional value of DiFranco’s work. But much as my relationship with kale, I can’t seem to make it through a whole plate of it. By contrast, the smooth stylings and tonal diversity offered by Chloe and Leah went down like warm gumbo. Very satisfying. 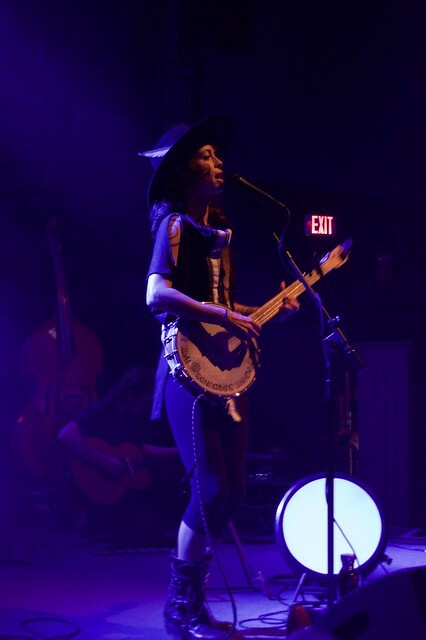 Here are some pictures of Rising Appalachia performing at 9:30 Club on May 25, 2018. All photos copyright and courtesy of Neal Keller.